You Can Build Your Own Doghouse! Anybody who owns a dog will know that they can be expensive. Vets bills and food supplies soon mount up and this is why so many dogs end up abandoned in rescue centers or put out on to the street. Responsible dog owners are aware of the costs which a pet incurs and so go into it with their eyes open. However, an unnecessary expense is that involved with the purchase of a doghouse. Many dog owners allow their pets to sleep in the home with them, thus eradicating the need for an exterior doghouse. But others prefer to distance themselves somewhat from their pets, preferring them to sleep outside at night. For these owners, the need to buy a doghouse is essential. These can range from budget buys which are little more than a wooden shell, to hugely extravagant constructions complete with a porch and stairs to make their kennel into a luxury home. Obviously, the cost rises proportionately to the quality of the doghouse. However, there is an alternative option. You could build your own doghouse. You would still be required to pay for the supplies and you would have to do the work yourself but it means that you can tailor the doghouse to your pet. A doghouse should be large enough for your pet to comfortably turn but no bigger than that in order for it to retain the dog's body heat and so self-insulate to a degree. Most readily available dog houses that you can buy from pet stores or similar places are a fairly standard size. Given that your doghouse should be sized in relation to your specific dog, you may find that, if you have a particularly large or small dog, that the shop bought ones are not ideal. Therefore, building your own can solve this problem. There are a few things to remember when buying the materials for your doghouse. The first is to ensure that the doghouse is raised from the floor slightly to prevent moisture from seeping into the wood. The second is to ensure that you purchase exterior grade plywood and not pressure treated plywood. Exterior grade is slightly harder to come by as the majority of hardware stores sell pressure treated. However, this is treated with chemicals which may be harmful to your dog if they chew it. These are the main things you need to adhere to when building your own doghouse. 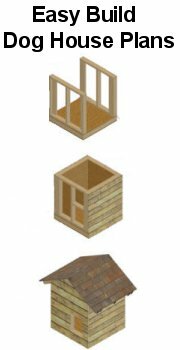 As long as these three areas, the size, raised from the ground and use of correct wood, are correct you can pretty much do what you like in terms of design and build. Why not decorate the finished doghouse to suit your pet's personality? That is what I call a designer home!